Caitlin from The Mrs. Everything is sharing how you can create sweet keepsake pillowcases for your kiddos using Color Chimp HTV! For more project ideas and inspiration, be sure to check out the Craftey Community! I am always trying to think of ways to make memories for my kids and create special keepsakes for them. I thought it would be fun to use Color Chimp HTV to create keepsake pillowcases that could be signed by all of the kids in their class. I am planning to create these pillowcases for my kids each year as they are growing up so they will have one for each grade that they are in. While they are still so young right now, I decided to go ahead and do one for them this year since they love their little daycare friends so much! This project is super quick and easy, but it is sure to be something that your children will treasure for years to come! Sweet teachers that are willing to help you out with this project! The first thing that I did was open Silhouette Studio and create my designs. Since you will be using HTV, make sure to mirror your designs before you cut. I chose to do the names in black and the main part of the design in different colors, so you can select which parts of your design you want to cut when you go to your cut settings. 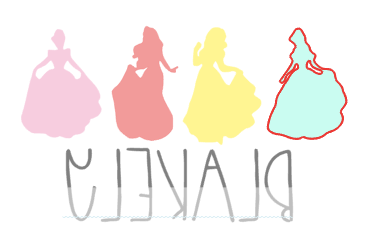 As you can see with the princess, I selected "No Cut" on every portion of the design other than that one princess. Depending on the number of colors you decide to use, you might have several different cuts. Even so, this is still a quick and easy project! Once you have everything cut, lay out the pieces on your pillowcases. When everything looks good, you can either use a heat press or iron to adhere the HTV to the pillowcases. Now your pillowcases are done! All you need now is fabric markers, fabric paint, and teachers that are willing to help you complete your keepsake pillowcases. Since my kids are only 1 and 3, I asked their teachers if they would do handprints with each child's name since they are too young to be able to write their names. Both of their pillowcases are still a work in progress, but I had to snap a picture of Blakely's so you can see just how cute these are! I will be sure to share more pictures as they are completed. In what ways do you like to use vinyl to create keepsake items? I would love to see how you #getcraftey!